In very frequented passages, a redan or a lunette, is thrown up on the exterior to cover the outlet, and thus ensure its safety in case of surprise. And Wheeler, in the post-war, mentioned a similar arrangement, but perhaps narrowed the application to those larger outlets, for sorties, where simple interior traverses would not be practical. Figure 48 offers a wide redan in front of an outlet, which is further covered and flanked by by the “horns” of the larger work. A very well protected outlet, we might say. Mahan considered this a Redan Line. On Figure 49, we see much more complexity. Particularly with the defensive lines of fire. The outlet is nested within a redan of a larger line. On both sides are faces within redans of differing angles. This is considered a Tenaille Line – a proper definition we will discuss later. But the point being the covering redan, to the front of the outlet, was absolutely necessary here in order to protect that weak spot. The covering redan is somewhat off center of the outlet, perhaps to limit exposure at the expense of accessibility. The question I have in regard to these advanced, detached “parts” covering openings is… just how often were these employed during the Civil War? When examining surviving earthworks, we often find the area around the outlets obliterated. Sometimes, due to necessity, that is done to facilitate visitor access. But more often, just a case where the structures around the outlets were the most susceptible to erosion. This was, some have said, the largest fort built during the war. And in this plan we see examples of many features suggested by Mahan. Specific to the outlets, we see up near the top that Battery Cruft was a detached lunette (maybe a “half lunette”) covering an outlet. Elsewhere, such as next to Lunette McCook at the bottom right, we see an outlet (an existing road) without a covering redan or traverse. Though we do see obstacles erected to the right of Lunette McCook. And certainly that named work was positioned to dominate the approaches to the outlet. Furthermore, what you don’t see in my “snip” are works in advance of the fortress that covered the railroad and road. Though those were oriented south and not regarded as covering the outlet in question. Here we see five road crossings at the main line of the works. One of those is blocked entirely by a redan. The other four (including one that appears to be a path cut just to clear a redan) have no traverses or covering works. Just obstacles placed in front. If we are assessing the protection of outlets, with Mahan’s suggestions in mind, we find a mixed application of those covering redans. Seems to me the use of that sort of feature was based on the engineering assessment of need. Now the scale of these maps mean these are not so much “plans” as operational maps. So we know there are structures that escaped the pen here. But what stands out, with double underlines, is the use of something far more elaborate than Mahan and Wheeler discussed. We see entire sections of works advanced in a manner to provide staging grounds for those formations preparing for the assaults. Major assaults, mind you, involving whole divisions. These were, you see, works built for the offensive. Grand offensives! In that light, might we say the entire Federal line was one large “covering work” in front of an array of staging areas and supply depots? Last week, I gave a lengthy justification for readers to consider winter encampment activities as related to the Civil War. Overlooked, as we are drawn to the battles or campaigns, these encampments did much to setup those more “attractive” events. One of the examples I offered was the Army of the Cumberland’s stay, which lasted well into the spring, at Murfreesboro in 1863. The length and breadth of that activity deserves full book length treatment, in my opinion. But for the moment, allow me to focus on one category of that encampment’s activities – reorganization. Rosecrans had three hats. 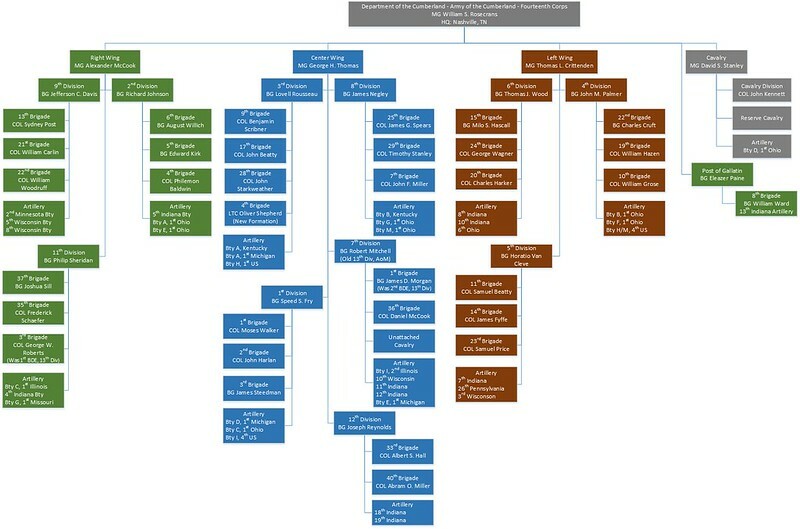 At this period of the war the “commands” of Department of the Cumberland, Army of the Cumberland, and Fourteenth Corps were almost interchangeable. The formation of the Department/Army/Corps was a hand over from the previous Army of the Ohio as it was under Major General Don C. Buell. In the old Army of the Ohio, there had been an organization for the field, for campaigning, and an organization on paper, for administration. The former was built around wings and was temporary to meet situations. The later included numbered divisions (up to Twelve) with separately numbered brigades (into the thirties). When Rosecrans assumed command, he gradually changed that arrangement, first with three somewhat permanent wings. 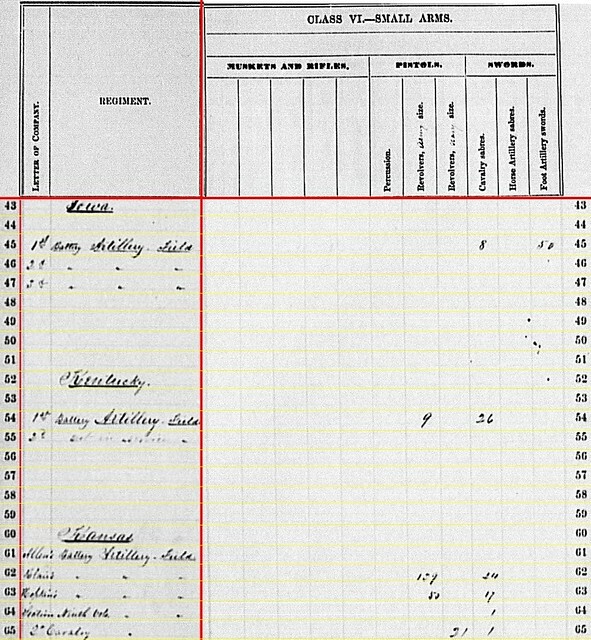 But even as late as the middle of December 1862, the army still operated with the division and brigade designations from before. For example, Major-General Alexander McCook commanded the Right Wing constituted of the 9th Division (13th, 21st, and 22nd Brigades), 2nd Division (4th, 5th, and 6th brigades), and 11th Division (37th and 35th brigades, plus a brigade brought over from 13th Division, formerly 1st Division of the Army of the Mississippi… a sidebar for later discussion). Just days before battle at Stones River, Rosecrans reverted the division/brigade numbering to a more conventional format – that we are more familiar with, having each wing’s division numbered internally, and likewise each division’s brigades likewise numbered in sequence. 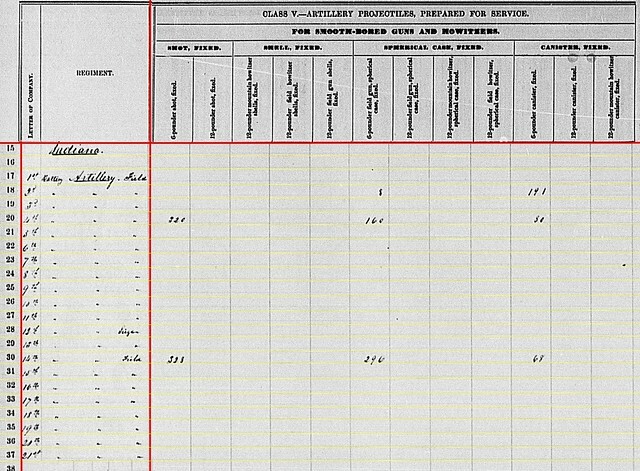 To that last set of points, consider the 41st Ohio, which was in the 19th Brigade, under Colonel William B. Hazen, and in the 4th Division under Brigadier-General John M. Palmer (who’d transferred over from that Army of the Mississippi division, by the way). Just before the big battle, the 41st Ohio’s parent organization changed to Second Brigade, Second Division, Left Wing, Fourteenth Corps. Just a paper change, you say. But think about it from the perspective of the officer trying to sort out who is aligned on his left or right flank. That might be the “old” 22nd Brigade of Brigadier-General Charles Cruft showing up. Or it might be the “new” Third Brigade, First Division, Left Wing, which used to be Colonel Charles Harker’s 20th Brigade. You see, there were three possible names for each brigade that might possibly be in play at Stones River. Now I am placing more emphasis on that factor than probably ought to be. I know of no cases where confusions derived on the field due to the designation changes. Usually, as we know from official reports, the reference was to a commander’s brigade by name. If there was any confusion, it was usually confined to the staff when managing the administrative details. However, there’s a subtlety here we should be keen to. 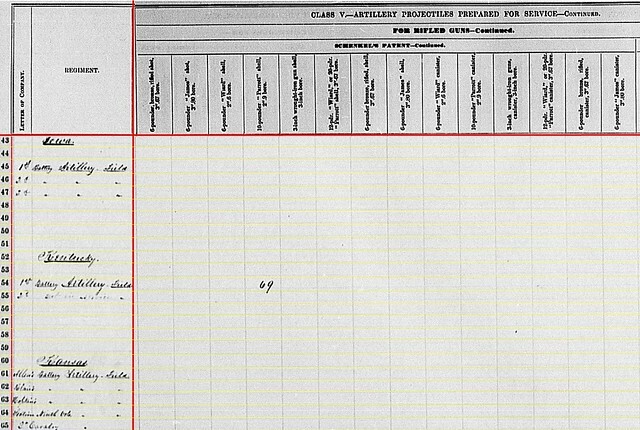 Prior to December 1862, a soldier in Hazen’s Brigade carried the name of his unit as the 19th Brigade. That carried with it a somewhat implied detachment from divisions and corps. The brigade might be reassigned to another formation on a temporary basis. That’s why it was numbered in such manner. But once the designation was changed to reflect an ordinal under a parent division, that changed. Now Hazen’s Brigade was bound to Second Division… though that division might move between wings or assignments as needed. Maj. Gen. George H. Thomas is assigned to the command of the Fourteenth Army Corps; Maj. Gen. A. McD. McCook to the command of the Twentieth; and Maj. Gen. T.L. Crittenden to the command of the Twenty-first Corps. 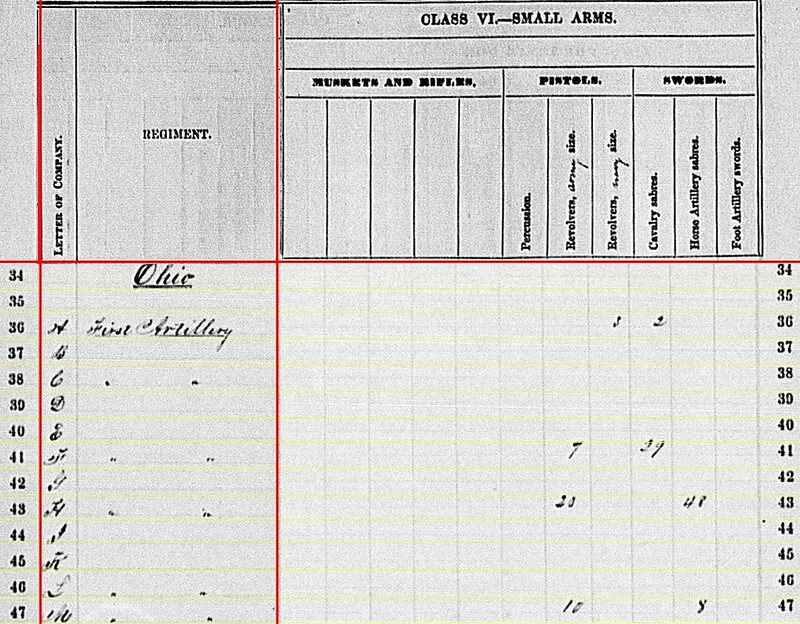 Now the soldier in the 41st Ohio was part of the Second Brigade, Second Division, Twenty-first Corps. There is certainly a formality to that. And more importantly an attachment to a formation. At some point down the road, people would start talking about corps badges and such. And yes, the organization was more balanced than that used at Stones River. 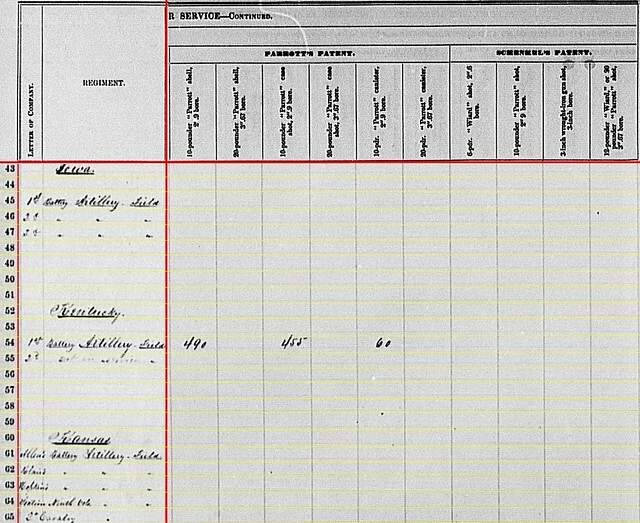 You’ll note that as Fourteenth Corps became a subordinate formation, Rosecrans lost one of his many hats, being “only” the army and department head. Still Thomas had a “big” command with the Fourteenth Corps’ four divisions. But the overall result was to give Rosecrans a more responsive organization. We could well drill into particulars, namely with cavalry and other “lightning” formations if you get my drift. But even at the high level, this looks like a flexible, responsive, and fighting formation. There’s another subtle part to this which also need be addressed. Rosecrans issued his own general order effecting the arrangement of the corps. But that referenced the War Department’s order. And as you read it, yes that was the President’s orders. From the top. You see, prior to January 9, if Rosecrans had an issue, hypothetically speaking, with a wing commander, he might figure a way to administratively move him out. But after January 9, any changes with the corps commanders had to be made with the blessings of those in Washington… top people in Washington. 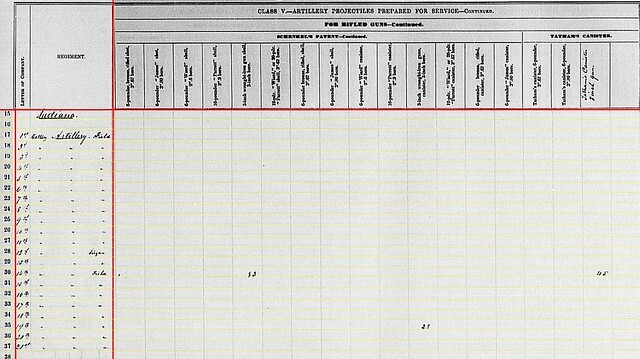 This reorganization served to bind the subordinate formations, right down to the individual soldier, to a unit. Likewise we see the “big army” was somewhat bound to the soldier. Of the seven batteries with data for the form, we see all posted late. Three were received in the spring of 1863. Three more trickled in through the summer and fall. 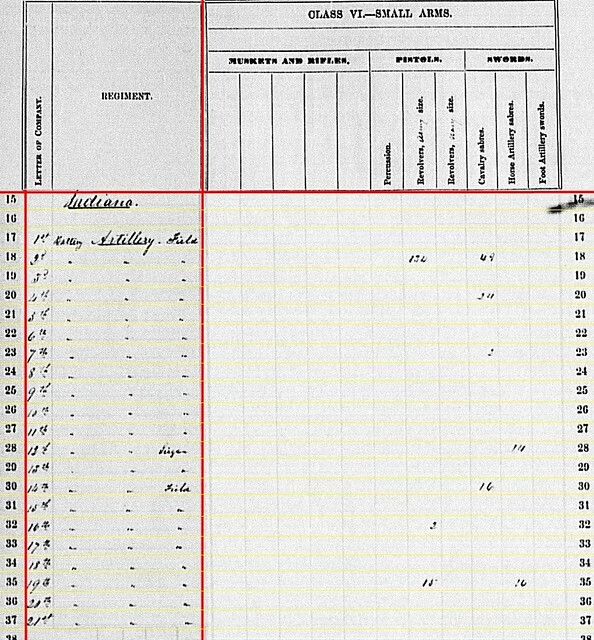 Then the 2nd Indiana Battery’s was received in April 1864. All must be considered when reviewing the data presented in the summary. 1st Battery: No report. The battery was part of the short lived Army of Southeastern Missouri, operating in the Ironton area. 2nd Battery: Springfield, Missouri. Three 6-pdr field guns and four James 3.80-inch rifles. The battery was in the Army of the Frontier. 3rd Battery: No report. Part of the Central District of Missouri and reported at both Rolla and St. Louis during the quarter. 4th Battery: La Vernge or Lafayette (? ), Tennessee. Two 6-pdr field guns and two James 3.80-inch rifles. The 4th was in the Right Wing, Army of the Cumberland, specifically, Sheridan’s Third Division. The battery was in action at Stones River on December 31. 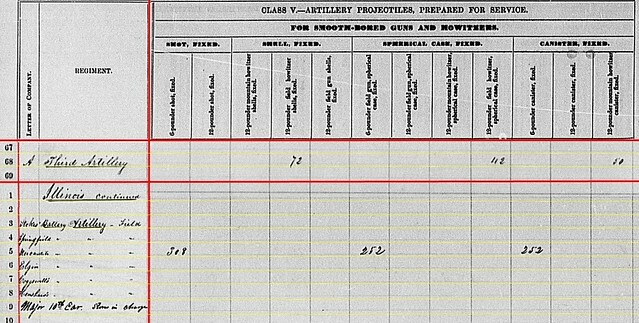 Captain Asahel Bush’s official report mentions the battery had one more cannon on hand – a field howitzer (12-pdr). One 6-pdr and a James rifle were lost on the field. And the other 6-pdr disabled. The battery fired 1,160 rounds in the battle. Losses were six killed, seventeen wounded, and three captured or missing. 5th Battery. No report. Was posted to Second Division (Johnson), Right Wing, Army of the Cumberland, and at Stones River. Captain Peter Simonson mentioned two 10-pdr Parrotts and two 12-pdr Napoleons in his official report of the battle. The battery fired only 213 rounds in the battle but lost two guns. 6th Battery. No report. The battery was in the multi-armed Thirteenth Corps and with McPherson’s Right Wing in northern Mississippi. 7th Battery. Murfreesboro, Tennessee. Four 10-pdr Parrotts. The battery was in Van Cleve’s Third Division, Left Wing, Army of the Cumberland. Captain George Swallow’s battery fired 406 rounds in the battle at Stones River, lost no guns, suffered four killed and eight wounded, along with losing one horse. 8th Battery. No report. First Division (Wood), Left Wing, Army of the Cumberland. Lieutenant George Estep’s battery fired 871 rounds at Stones River. 9th Battery. No report. 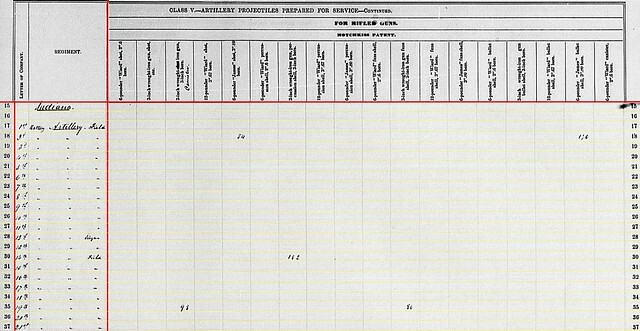 Captain George Brown’s battery was assigned to Fourth Division, Right Wing, Thirteenth Corps. 10th Battery: No report. 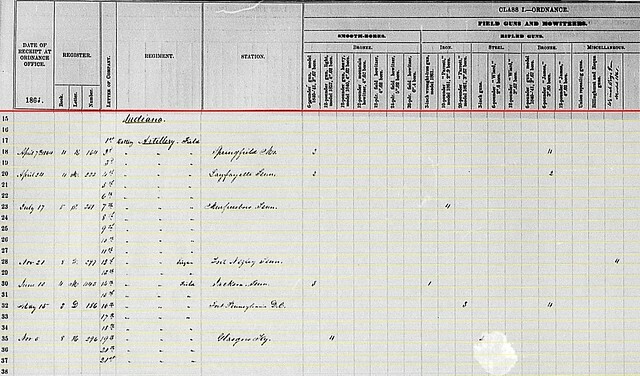 Captain Jerome Cox’s battery was also assigned to First Division, Left Wing, Army of the Cumberland and at Stones River. The battery fired 1,442 rounds during the battle. 11th Battery: No report. Though assigned the Army of the Cumberland, this battery was part of the Nashville garrison. 12th Battery: Fort Negley, Nashville, Tennesseee. Annotated as “siege.” Four 4.5-inch siege rifles. 13th Battery: No report. Also annotated as a “siege” battery. I have no particulars on this battery. It was posted to Gallatin, outside Nashville, and some reports have it operating as cavalry. 14th Battery: Jackson, Tennessee. Three 6-pdr field guns and one 3-inch Ordnance Rifle. The battery was part of Thirteenth Corps at the time. 15th Battery: No report. Had surrendered earlier in the fall at Harpers Ferry. Was still on parole. 16th Battery: Fort Pennsylvania, DC. Three 20-pdr Parrotts and four James 3.80-inch rifles. This battery spent most of the war defending Washington. 17th Battery: No report. 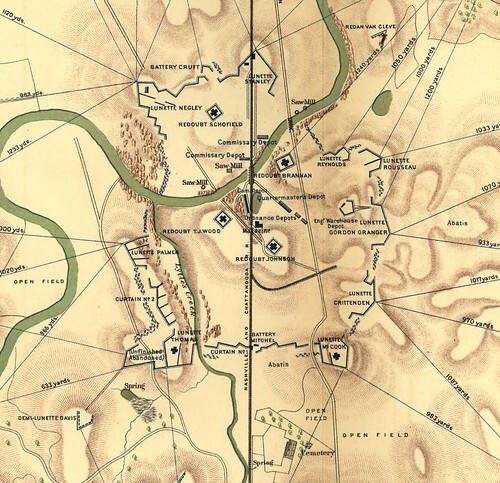 The 17th Battery was assigned to the Middle Department and the defenses of Baltimore. 18th Battery: No report. Though assigned to the Center Wing, Army of the Cumberland, this battery was not at Stones River but rather supporting troops pursuing Confederates raiders. 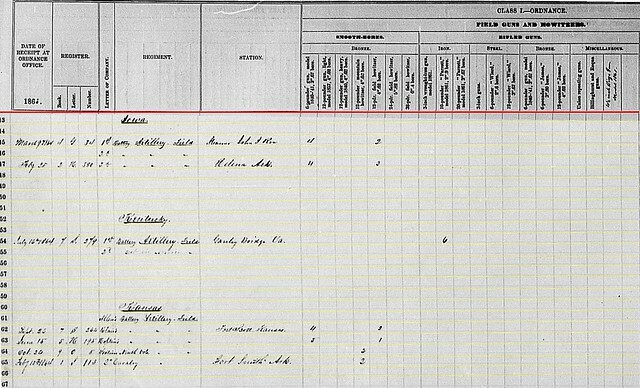 19th Battery: (Illegible), Kentucky. Four 12-pdr Napoleons and two 3-inch steel guns. Also assigned to the Center Wing, the 19th was likewise active in pursuit of Confederate raiders at this time of the war. 20th Battery: No report. 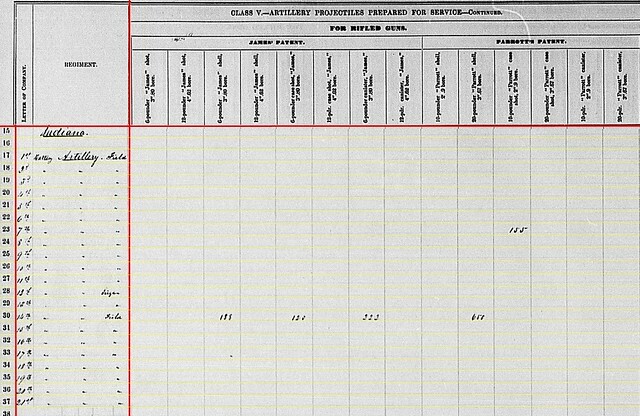 Assigned to the garrison of Henderson, Kentucky. 21st Battery: No report. On duty at various locations in Kentucky. Sorry for the lengthy interpretation, but a necessary listing for the purposes of these posts. There are several batteries (particularly the 19th Indiana) that I’d like to discuss further. But for now let me save those for separate posts in the future. 2nd Battery: 6-pdr field gun – 8 spherical case and 191 canister. 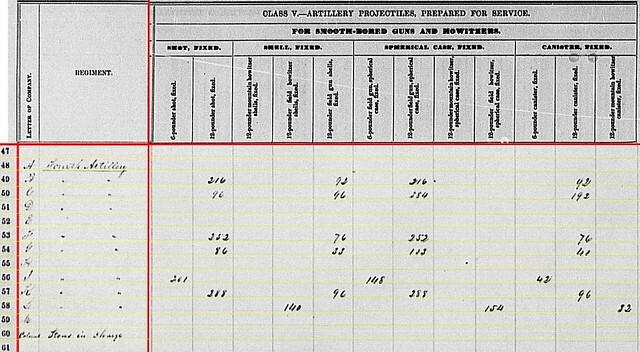 4th Battery: 6-pdr field gun – 320 shot, 160 case, and 30 canister. 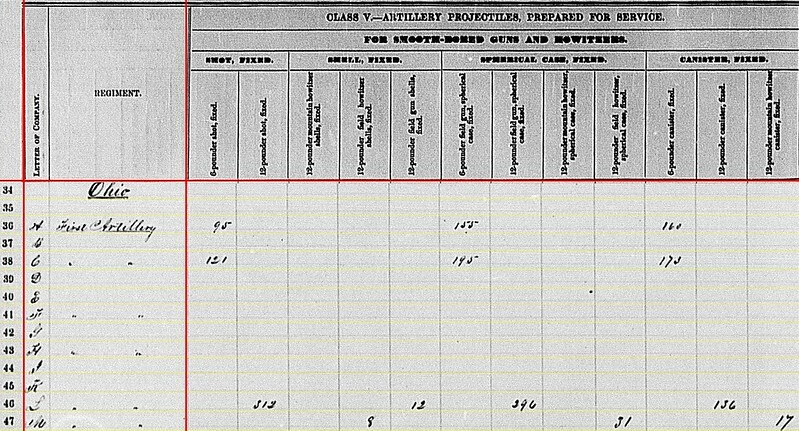 14th Battery: 6-pdr field gun – 328 shot, 296 case, and 68 canister. 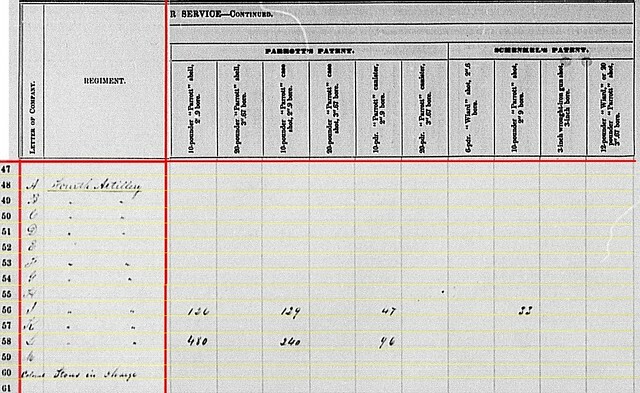 2nd Battery: James 3.80-inch – 54 shot and 176 (?) bullet shell. 14th Battery: 162 of Hotchkiss pattern 3-inch percussion shell. 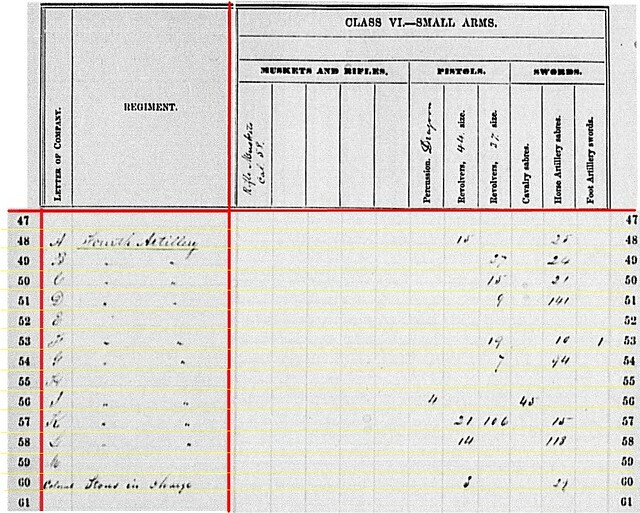 19th Battery: 3-inch rifle – 98 canister and 86 fuse shell. 7th Battery: 155 Parrott 10-pdr case shot. 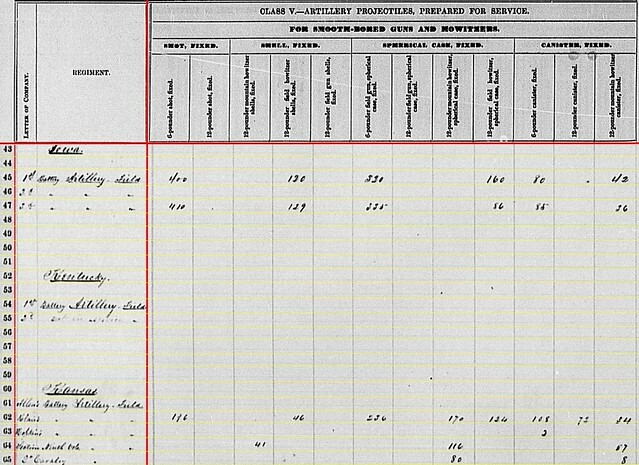 14th Battery: James patent 3.80-inch – 188 shell, 120 case shot, and 222 canister; and 650 20-pdr Parrott shells. Clearly a battery posted to defend the nation’s capital got plenty of ammunition! 14th Battery: 83 3-inch Schenkl shells and 45 3-inch Tatham’s canister. 19th Battery: 28 3-inch Schenkl canister. 2nd Battery: 134 Army revolvers and 49 cavalry sabers. 4th Battery: 24 cavalry sabers. 7th Battery: 2 cavalry sabers. 12th Battery: 14 horse artillery sabers. 14th Battery: 16 cavalry sabers. 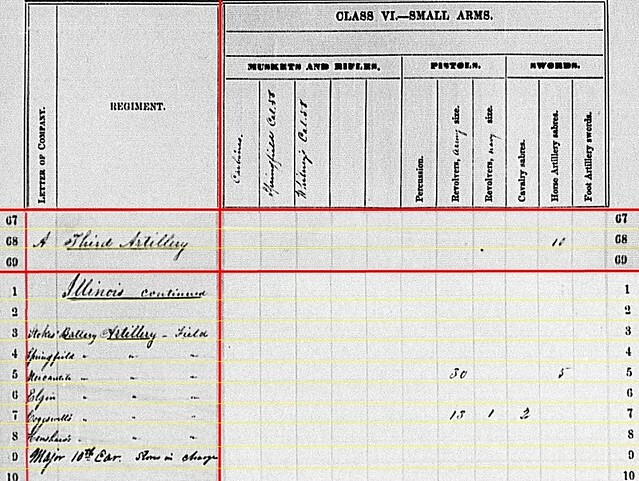 16th Battery: 2 Army revolvers. 19th Battery: 15 Army revolvers and 16 horse artillery sabers. Other than the “everyone gets a revolver” in the 2nd Battery, we might consider this a “meager” allotment of sabers and pistols. That concludes the lengthy summary of the Indiana batteries. Keep in mind that a quarter of these batteries were in action at the end of December 1862 at Stones River. And those batteries expended around 4,000 rounds between December 31 and January 2. 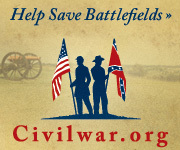 Not to mention the lost guns, equipment, horses, and lives in the battle. What I am left wanting is a “before” and “after” accounting from those batteries of equipment. Such would offer a measure, on paper, of the violence seen at stones River.